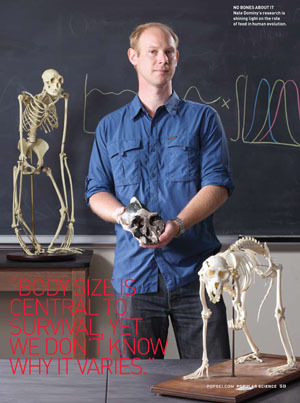 Popular Science magazine named anthropologist Nate Dominy one of its 2009 "Brilliant 10" young scientists. Photo courtesy of Popular Science. Popular Science magazine has named UC Santa Cruz anthropologist Nathaniel J. Dominy one of this year's "Brilliant 10" young scientists and researchers. Dominy, an associate professor of anthropology, is profiled in the November issue, on newsstands today (Oct. 15). It is the magazine's ninth annual "Brilliant 10" issue, which shines a spotlight on men and women under 40 whose work "will change the future." Winners were chosen from hundreds of nominees. Dominy, 33, is a bold researcher who has already made significant contributions to the study of human evolution. His work focuses on the acquisition and consumption of food; his goal is to identify the nutritional jackpot that gave our forebears a major advantage over all other primates. To that end, he explores the diet and foraging behaviors of hominins, the early human ancestors who lived 2 million years ago. A creative and indefatigable scientist, Dominy works at the intersection of anthropology, ecology, and genetics to understand what fueled the development of bipedalism and big brains. Writing from Uganda, where he is on a research expedition, Dominy said it is an honor to be included among the "Brilliant 10," all of whom bring an "integrative" approach to their work. "Many scientists carry a hammer, and for them the world is made of nails," wrote Dominy. "It is evident that each Brilliant 10 carries with them a diverse toolkit." UCSC Chancellor George Blumenthal congratulated Dominy on being selected. "This honor will bring Professor Dominy's prodigious talent to the attention of a broad audience," said Blumenthal. "We at UCSC know that his dedication to research is matched by a deep commitment to teaching. He is a gifted teacher and a wonderful role model for aspiring scientists." With more than 7 million readers each month, Popular Science (www.popsci.com) is the world's largest science and technology magazine. The honor is the latest for Dominy, who in 2007 won a prestigious Packard Fellowship for Science and Engineering from The David and Lucile Packard Foundation. Dominy is in Africa to launch a multiple-continent investigation of pygmy populations to study the biomechanics and metabolic costs of locomotion.